The console says [PROJECTNAME]OK after running a program. ?" is only used if uo're bad. The distance between letters (or between letters and other objects) isn't just the distance between the bounding boxes, it depends on the actual shape. If you measure at the corners (for example), the O is actually further away from the edge than the K. You don't have to think of it as making the O off center. but you can't run OK as a command, and ?" is meant to have something after it. Wouldn't it be faster to use an actual SVG editor? Don't use an elliptical boundary, just use the boundary defined by the edges of the letters. Wow that's... WEIRD. It looks good all small but I really don't like the drop shadow when it's big lol. I changed the "shadow" to the same color as the edge of the logo (with an opacity of 33%), so it looks a bit better. 16x16 PNG: SVG: <svg viewBox="0 0 16 16"> <g stroke="rgb(0,150,136)"> <!-- BORDER --> <line x1="7.5" y1="7.5" x2="8.5" y2="8.5" stroke-width="15" stroke-linecap="round" opacity="0.33" /> <!-- side --> <circle cx="7.5" cy="7.5" r="6.5" fill="black" stroke-width="2" /> <!-- circle --> </g> <g fill="white"> <!-- TEXT --> <path d="M3 6h1v-1h2v1h1v3h-1v1h-2v-1h-1z M4 6h2v3h-2z" fill-rule="evenodd" /> <!-- O --> <path d="M8 5h1v2h1v-1h1v-1h1v1h-1v1h-1v1h1v1h1v1h-1v-1h-1v-1h-1v2h-1z" /> <!-- K --> </g> </svg> Keep in mind that this one is only meant to be displayed at 16x16. If possible, the current one (or some variant) should be used when displaying the logo at larger sizes. 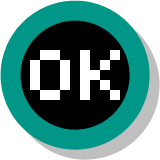 Trying to get a logo to look good at 16x16 pixels and 1000x1000 will just make it look worse.